The reason for the difference in focus required for day versus night time viewing has to do with the dispersion of the different wavelengths of light. Basically the refractive indices differ for each wavelength of light. This difference is what makes white light separate into the rainbow of colors when it passes through a prism. A typical person can see wavelengths from about 390 to 700 nm (nano-meters) with the human eye. You can see the different wavelengths of light when light is passed through a prism and makes the rainbow of colors violet, blue, green, yellow, orange and red. Violet represents the shortest wavelength and red the longest. The different wavelengths make the different colors of light pass through the prism at slightly different angles which causes them to separate into the rainbow of colors. For IR light, the illuminator provided with the X-Sight is about 840 to 850 nm which is a significant difference from the normal visible spectrum. To keep it simple, as the IR light passes through the objective lens, the longer wavelength of the light will cause it to have a slightly different focal plane than the average focal plane for the white light spectrum. I feel this shift in focal plane was the issue with the 3-12x models when they were originally released without a focusing ring. The 3-12x model I had for a couple of days seemed to have a great day time focus, but the night time focus was not crisp. OK, so what, you have two different focal adjustments that are required for day versus night time viewing. There were times where I setup on a feeder during the day and had the focus dialed in perfectly. When I returned later after dark, I had to go through the same routine again focusing the image. I know this doesn't seem like a big deal, but if you only have a couple of quick moments to capture your video or image at night, this can be a a little frustrating. In the photo below, you can see that the IR illuminator is mounted on the left side of the device with the front of the illuminator being directly beside the focus adjustment ring. The proximity of the illuminator makes it difficult to grip the focus adjusting ring and change the focus with your left hand while your right hand is gripping the rifle. This position also causes you to potentially cover the illuminator with your hand while focusing. Since you may be using this riflescope at night, if the IR light is blocked, you cannot see your image that your are using to focus. If you are left handed, this may not be a problem because you would most likely be adjusting the focus with your right hand. Fortunately, on an AR style rifle, there is typically an easy fix. Relocate your IR illuminator to a rail on your handguard. This gets it out of the way of the focusing ring, but I wouldn't recommend putting it fully forward on your handguard unless you have no other option because you still want to be able to easily turn the illuminator On or Off or make some adjustment to the beam coverage or intensity. The photo below shows the illuminator mounted on a forward handguard position on an AR style rifle. Another observation I had when focusing was the significant amount of resistance when rotating the focusing ring. To adjust the focus required having both a good grip on the rifle and a good grip on the focusing ring. Additionally, the full range of the focus ring is about 2.25 turns which means if you are going from very close range to long range, you must turn the ring a considerable amount. Also, the act of making the adjustment made it hard to hold the scope still on the image for verifying when you were in focus. 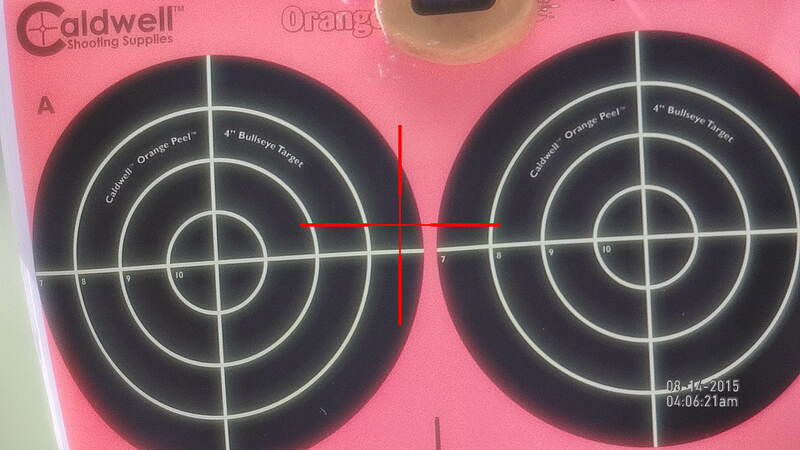 On a positive note, focusing from infinity to about 40 yards is only about 3/4 of a turn of the focusing ring. As I pondered this, I started thinking that perhaps I could find some type of device to go on the focus ring to give me more leverage. After doing a quick search on Amazon, I found the following Breakaway Nylon Coaster. This two pack costs $23, but if it worked, it would make changing focus much easier. I installed the nylon coaster on the focus ring and adjusted the coaster to allow me to be able to zoom from infinity to about 30 yards without having to make any adjustment to the coasters location. Since this gadget would not rotate all the way around the scope, if I needed less than 30 yards, all I had to do was loosen the ridged nut and slide the coaster off the focus ring and make the adjustment normally. I don't know if all X-Sights have a significant amount of resistance when changing focus, but I do know that adding this device took away any issues I had with focusing the X-Sight and I highly recommend you considering one for your X-sight. The 5-18x model has what I might consider as a macro focusing capability for a riflescope. I was able to focus on an object 10 feet from the scope which is not possible for most riflescopes in this power range which include parallax adjustment features. This photo below was taken using the camera feature within the X-Sight at a distance of 10 feet. Although I didn't take another photo, the digital zoomed image also remained in focus as I zoomed in on the target. This next video shows some more details on the close focus capability of the ATN 5-18x X-Sight. Remember that the total travel of the focus ring is about 2.25 turns and 3/4 of a turn gets you from infinity to about 40 yards. This means that from 10 feet to 40 yards is around 1.5 turns which also means if you have wildlife that are within 40 yards and are moving around, you will find yourself continually adjusting the focus as they get closer and farther away from you. 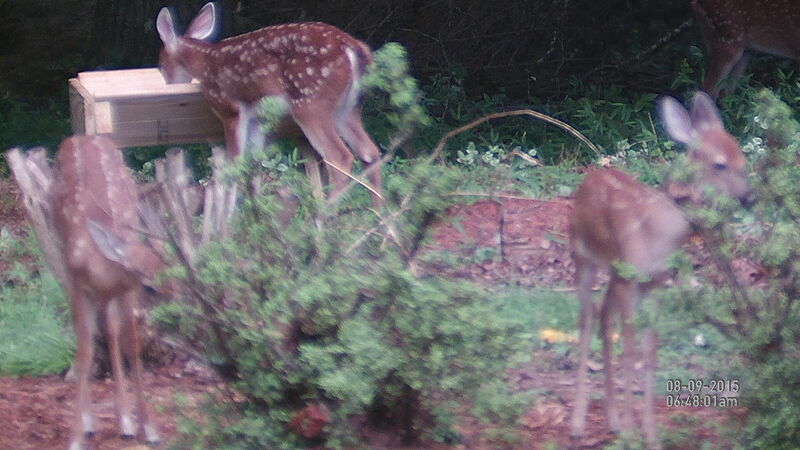 To better explain, the photo below shows my backyard feeder about 35 yards away and four fawns. The X-Sight if focused on the fawn farther in the woods (top right in the photos), yet you can see that the fawns about 8 feet in front of the feeder are no longer in focus. As they moved closer towards me, I had to continually adjust focus to keep up with their movement. In reality, a slight out of focus situation would not have any impact if you were hunting. The times this comes into play is when you are actually taking video or photos and you want a sharp crisp image. I feel the close focus capability of the ATN 5-18x X-Sight is a great feature that they should advertise in their specifications. When I added the gadget to the focusing ring to give me more leverage for focusing, the firm resistance of the focusing ring became very manageable. If you have the option on your rifle, I suggest moving the IR illuminator from the scope to another location on your rifle so that it doesn't get in the way of you adjusting the focus. Last, always remember you will have a different focus adjustment for day versus night situations. Once I worked through the learning curve of these details, setting up and using the X-Sight has become even more enjoyable.